1. On the return date, place everything into the original box. Stick the provided, pre-paid shipping label on the box. 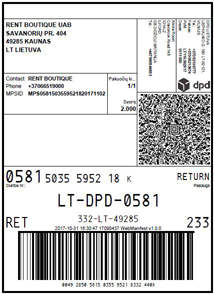 Pre-paid shipping label example. The original label will be placed in the box. 3. Bring the box to your selected pick up point. If you plan to WEAR just SOME items from the order, do not worry and return everything together on the last day of your order.